Shabu shabu is a delicious and healthy way to eat meat. It is usually made with beaf, but pork can also be used. We slice the meat into thin strips, and prepare various vegetables, such as leeks, mushrooms, chinese cabbages etc.,along with some cubes of tofu. We put a camping gas fire in the middle of the table, boil water in it, and throw in the ingredients. The meet comes lost and each person at the table will put in his or her own meat and stir it carefully with chopsticks. This makes a sound like “shabu, shabu”, which is where the dish gets its name from. The key to successful shabu shabu lies in the sauce. Typically, two kinds are used — ponzu and sesame. But there are also a few secret alternatives that I’ll be happy to tell you about. 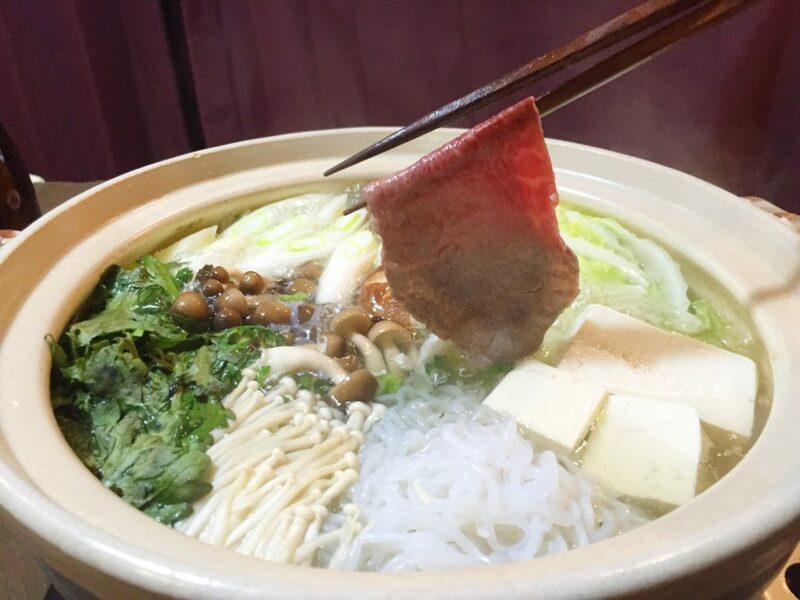 Shabu shabu is a very sociable dish, guaranteed to bring family and friends gathered close together around the table as the swish their strips of meat in the bubbling broth. If you tend to think of meat as being heavy, greasy food – think again! This is the most delicate and subtle way there is to taste fine meat. Making two kinds dipping source, soysource-based and sesame-based. Cooking shabu shabu on the table with prepared vegetables and wagyu.